When an element erodes or “destroys” another element, we destroy that elements qualities using the destructive sequence. You will use the Destructive Cycle when you need to weaken a particular feng shui element in your home or office. For example, if the Water element in a specific area is too strong and you cannot remove the decor element that brings the Water energy – such as mirrored closet doors in the West area – then you need to weaken the Water element. In order to do that, you will bring the Earth element to put down/absorb the excess Water energy. Now that you understand the basics of the productive and destructive cycles of the five feng shui elements, let’s get back to our example of a fireplace in the East area. Let’s see how we can remedy the situation by using the newly acquired knowledge about the two main cycles of feng shui elements. 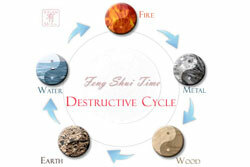 To strengthen the Wood element and weaken (destroy) the Fire element in the East feng shui area of a home.